If you are looking for loads of space and wonderful grounds and views then this is the property for you. Ideally located and set up for two families with two lounges and a garage with a pool table. A top quality mountain Lodge set in beautiful gardens with your own stream and bridge. Full facilities all on one level. Two lounge areas with decks and mountain views. Two queen bedrooms have full mountain views. the third bedroom has a queen bed and three bunks. A delightful private and spacious lodge with just an easy walk into Ohakune town. Two bathrooms, three (3) bedrooms, laundry and drying room. There is a play station for the kids and a pool table in the garage.. FREE WIFI and My Sky HDI! A true mountain lodge living environment with an open fire a wood burner and heat pump..
We have a two (2) night minimum stay policy. We have a long time association with Ohakune and the beautiful mountains of the Central Plateau, New Zealand. The Lodge is great for two families with two lounge areas, great dining room, large bed rooms and lots of space on the covered decks. A great place to relax and enjoy the mountains. We love the mountains and the Lodge in Ohakune is perfect for families and couples. Close to town but in a peaceful rural setting that offers unimpeded mountain views. Sky TV, Wifi , playstation and pool table, extensive covered decks with mountain views, a stream and lovely gardens. shower, Stand alone shower room. 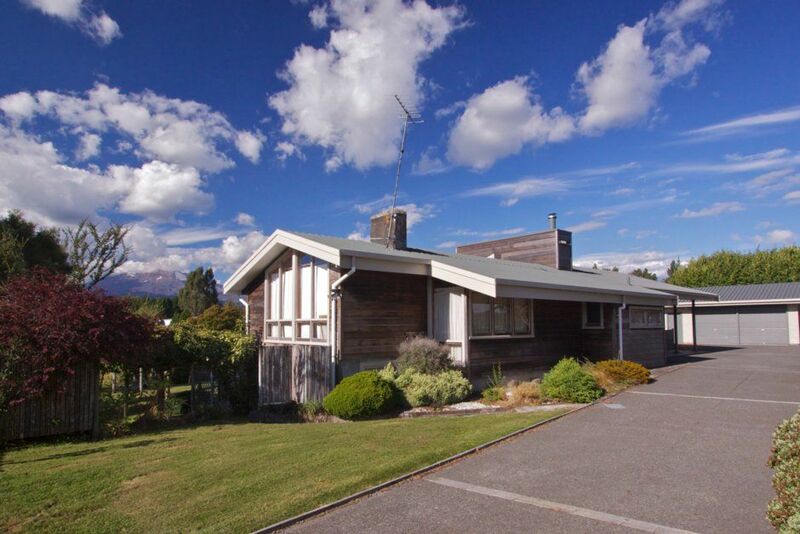 Fantastic views of Mt Ruapehu from the bedrooms, lounge and decks. Heat pump in the main living area that keeps the Lodge warm and cosy. A large open fire in the main lounge that is warm and great for atmosphere and an efficient wood burner with a wet back in the kitchen / dining area that pumps out plenty of heat. We have two entrances to the Lodge and lots of car parking space. There is also a large garage that with a pool table that also has space for one car. We have two large lounge areas. One with lots of seating and a fire place and the other with a couch, day bed and additional TV with video and a Play Station. Large beautiful wooden dining table with seating for up to 10 people. Two TV's available. The TV in the main lounge has Sky with Movies and Sport. The TV in the second lounge area has video and a Play Station. Two DVD players available plus a selection of DVD's. A large collection of books and games for the kids. In the garage there is a pool table and space to hang out. Extensive private lawns and garden areas with a stream running through the property. There is a bridge over the river to enable access to the lower part of the garden. We have a large deck area that is mostly covered and able to be used in all weather. There are wonderful views of the grounds, stream and mountain from the deck. The Lodge is in Ohakune close to the extensive Ski fields of Turoa and Whakapapa on Mount Ruapehu. The Waimarino Golf course is just a few minutes drive away. The property is large and all one one level so should be wheelchair suitable.